Home Business How to Get Cheap Car Insurance in the Philippines? I have been taking care of a car since 2008. I must admit that in a country like the Philippines where nobody had an assurance that people who drive along with you side by side possess the right attitude and knowledge that it takes to be a qualified driver. Drivers here for as long as you know how to handle the steering wheel can drive and get a driver’s license. Yes, that is regardless if you have the proper education of the right driving skills and the right mind condition. This is where insurance comes in and with this issue, I must admit I’ve seen so many times how a decent quotation can help you find the cheapest cost for your car insurance in the Philippines. A very good guide can be found at the official website of the Insurance Commission of the Philippines. On the other hand, if you are a foreigner living, migrating or is just here for fun and travel, I suggest you hire a decent car instead or go find an Uber or Grab taxi for your day-to-day travel. This is the best and most convenient yet cheap way to go around Metro Manila and nearby provinces. Otherwise, get yourself a good and certified Filipino tourist guide. He will absolutely be of big help when you travel the country. And for those of you who own a car and wanted to get the best offer for your car insurance? Well, go get yourself a professional and qualified agent. This will save you a lot of money, time and effort. In the end, you will thank me for giving this simple yet very helpful tip to get cheap car insurance. If you’re still not in to trust anybody with your money’s worth, then go walk in to the nearest car dealer or go find an insurance provider using the internet. Otherwise, you best choice is to read carefully what I have to describe below so you will realize an eye opener regarding insurance matters. Below are the pointers to help you find a good deal for your car. Find a legitimate insurance agent or company by searching thru the internet – Use your instinct in determining which one is your best choice. You will know this by reading the contents of a website, the thoughts of the writer and where it leads you. 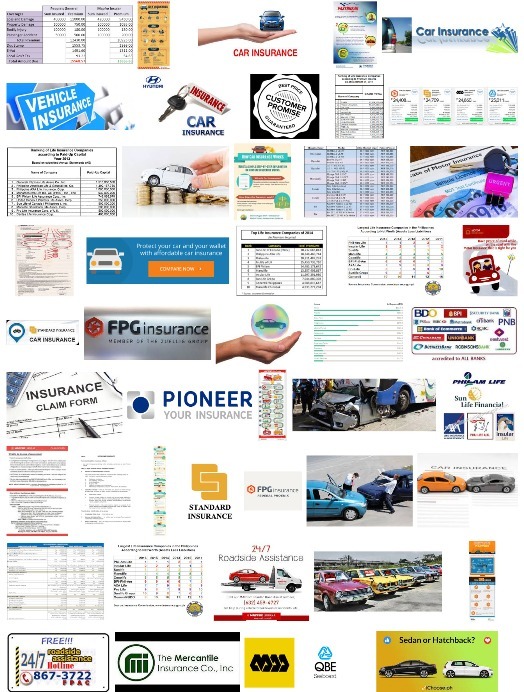 Visit this page for top insurance company rankings in the Philippines. A comparison site can be of great deal of help – Although it is a rare occasion for insurance comparison sites to be found in the Philippines using online search, there are a few of them who can give you an insight – ecomparemo.com is one good resource for this. Although I must admit that you have to be careful not to sign in any personal details to any website out there. It is much better if you can agree by calling directly any numbers provided by a supposed legitimate provider for car insurance. Find a decent list of car insurance providers that are duly accredited by the Philippine government. You can find a list at the official website of the DTI or Department of Trade and Industry or the Insurance Commission of the Philippines. You can also try to call their respective hotline numbers to confirm and suspicious offers or details posted elsewhere. Accreditation is very important so you won’t end up with scammers out there. Walk in to any car dealership – All dealers of brand new cars have respective offices for different insurance providers inside their premises. Ask for one from the marketing or officer on duty at the front desk. Visit forum websites for cars and vehicle tips – A good choice can be tsikot.com and topgear.com. These 2 websites are known for their tips with cars and best places and companies to get good deals offering free car insurance quotation. Be sure to take notice of very important factors such as loss and damage, damage to property, bodily injury, passenger accident etc. Always ask for a quotation from a provider – In case you already have a provider in mind, it wouldn’t hurt you a bit asking for a quotation first. You can use this later for comparison and never hurry yourself up. The enemy of getting the best offer is time. Always take your time to come up with the cheapest possible car insurance quotation. Know the factors that affect price of your insurance – There are definitely standards where companies base their quotation for a car insurance. Knowing these standards will absolutely help you because if one company considers one factor, it doesn’t necessarily mean that the other also does. Be sure to always ask which works and what doesn’t. Know what you require – There are just 2 types of car insurance and that is comprehensive with Acts of Nature or Acts of God (AON or AOG) and that which is non-comprehensive and without AON. Knowing which best applies to your need will help you come up with a big discount. In the Philippines, car insurance is probably one of the best businesses. Paying for what you don’t need is not required. For example, you are applying for car loan and you only need a comprehensive insurance to be able to maximize the loan approval you will get. This scenario will give you the clue that you don’t need to pay for AOG when not necessary for the purpose of getting a better deal for a bigger amount of loan. Know which service is most reliable – Although the price is your priority consideration when getting a car insurance in the Philippines, getting your money’s worth is definitely a good thing to talk about. You might want to think about which among legitimate companies offer the best service when times of need arises. You can also read reviews, blog posts and articles as well as visit car-related forums for this particular purpose in determining which company best serves their client during accidents and insurance claims response. Be extra vigilant in knowing the premium amount insured – This is a very important factor to consider apart from paying the cheapest car insurance. Also be sure to look and read carefully the terms and conditions as well as what is included in the services part during claims. It is very important to know what you are paying for. So by now you already have my 10 best tips above and it’s time to get an insurance for your auto. I won’t deny it that knowing which works and what doesn’t have made me one of your best choices for asking about car insurance. If by any chance you want or need more advice, I’m always free to contact. I have providers too on the line that I can personally guarantee a good service when it comes to claims and other insurance related services. Ask for a quotation directly from one of my providers now! – Sam Casuncad (0917-501-9245) (Globe with Viber). Know more about me and what I do by reading here.